Independent, third-party agencies closely monitor replacement window performance by evaluating how well a window unit performs in the harsh New Jersey and New York environment. These organizations examine how efficiently a frame material insulates, as well as considering the impact glass has on energy-efficiency and heat and light transfer. Some standards measure sound filtering capabilities and others allow consumers to compare the potential for moisture and air leakage. It can be a bit confusing, but it doesn’t have to be. 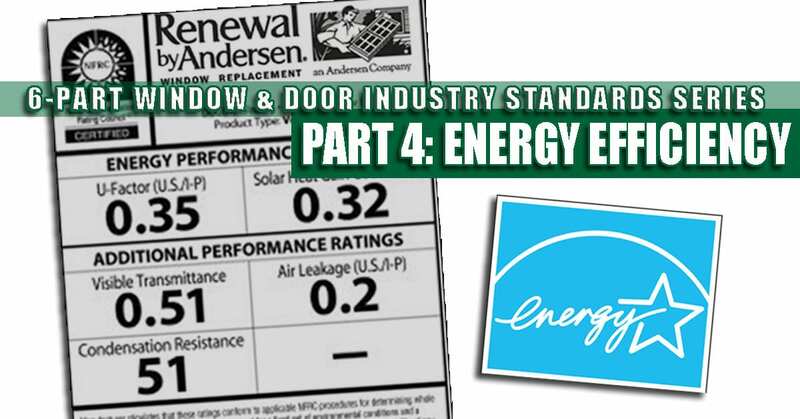 While there are many industry benchmarks, this Renewal by Andersen post highlights the most common ratings New Jersey and metropolitan New York homeowners should consider when preparing for a home upgrade with custom-built replacement windows. The highest-performing, energy-efficient home windows make your interior spaces more comfortable while reducing heating and air conditioning costs, providing your home is in otherwise good overall shape. If you have adequate insulation in the walls and ceiling, and no major damage to the building envelope, updating aging, poorly performing windows should start to repay you for your investment on the first utility bill after the installation. To get the most from your investment, you must buy replacement windows designed and built for superior performance. That means your windows should allow you to take advantage of solar energy during the winter, and block harsh heat in the summer. Features that control moisture levels and eliminate air leakage help your heating and cooling systems work more efficiently, and an efficient system usually costs less to operate. Having access to window performance ratings ensures consumers make better-informed decisions about which new windows to buy. These decisions can directly impact long-term financial benefits, as well as indoor air quality and comfort. The National Fenestration Ratings Council (NFRC) and Energy.gov both publish independent window rating ranges based on regional climate and weather patterns. Your needs may vary slightly depending on how much direct sunlight hits a particular window during daylight hours, surrounding structures, including landscaping, and your personal expectations. Talk to your replacement window specialist about maximizing energy-efficiency with low-E glass solutions for every window in your home. Once you know your specific needs, check out these vital ratings. Visible Light Transmittance (VLT or VT): (Range 0—1) High numbers show indicate light transfer. Demonstrates how efficiently a window utilizes sunlight to light your interior spaces. More light means less expense associated with artificial lighting. On the other hand, too much light can cause glare. Demonstrates air volume that enters a room through a window unit. Low numbers mean fewer drafts and cold spots, and lower heating bills during our hot, muggy summer months. Remember that construction techniques, frame materials, spacer design and placement between panels in a double-pane window and overall design can impact a window unit’s performance. We respect and value our New Jersey and New York customers. That’s why we are serious when it comes to making sure our windows and patio doors add value, lower heating and cooling costs and are built to last for as long as you live in your home. Need more information about replacement window performance ratings? Take a minute to fill in the short form on this page or reach us by phone at 1-888-826-2451.